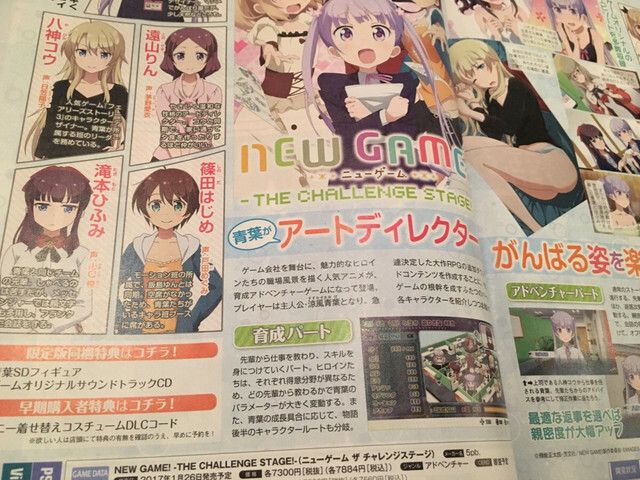 The anime New Game! which is about a game company will be getting its own video game adaption. Developed by 5pb, New Game! Challenge Stage will put you into the role of the newly hired Aoba. The game will have Aoba training in order to be able to assist in the creation of some DLC. Another feature of the game is Aoba getting closer to her co-workers. There will be both a regular and a special edition of the game. The special edition will have a soundtrack CD and will also have figures of some characters. New Game! Challenge Stage is set for release on January 26, 2017 in Japan.